I have been into home automation and home entertainment for several years. When I was having my current house built, I had a lot of pre-wire placed in the walls for security keypads, thermostats, cameras, speakers, and video. And I also placed empty conduit in my walls in a few strategic places just in case I hadn’t thought of everything when I built the house (I didn’t, because I have already needed the conduit. Several times.) Here, I thought I would discuss my Home Automation (HA) setup. First, I have the ultimate in home security, the Elk M1G. It is fantastic because it allows ethernet connectivity for monitoring by Elk specific programs or third-party applications, such as PowerHome. The end result is, if I open a door that is monitored by my security system, my home automation software, PowerHome, can detect that and react as I so designate. For instance, if I open my front door, the Elk tells PowerHome that the front door is open. PowerHome can check to see if it is dark outside, and if it is, it can turn my porch light on automatically. Then after I close the door, it will turn the lights off after four minutes. Want a text message if your security system alarm goes off? The Elk can handle this quite easily. Throw PowerHome on top of that and I could also have all the lights in the house start flashing. Starting to get the idea? I have mentioned PowerHome already, so let me tell you about it. PowerHome is a very customizable and programmable Home Automation program. The best way to use it is to keep it running 24/7 on an HA PC. HA PCs are nothing special (but it is probably a good idea to find one that draws as little electricity as possible). I also use my HA PC as a Home Theater (HT) PC. PowerHome can easily interface with my security system, the Elk M1G, my lighting control system, Insteon, and other human interfaces such as infrared remote controls, email, and text messages. Because of the excellent integration between the Elk and PowerHome, I can easily write PowerHome programs to monitor my security system and react to changes. Similar to the example above, I have also written a PowerHome program that monitors my motion detectors in my house. If no motion is detected for 45 minutes and the system is not armed, PowerHome sends my work email and cell phones text messages asking if I forgot to set the burglar alarm. I can also monitor my garage door, turn on my garage lights automatically when I open the door, turn on lights at sunset and turn them back off at sunrise, and many other handy convenient features. So, how do I turn on my lights? I use a lighting control system called Insteon. It allows me to link lights to switches in nearly infinite configurations. For instance, if I wanted my bathroom light switch to also turn on my garage light, I could do that. I don’t know why I would, but I could. I can also set up lighting scenes, such as movie watching and entertainment. Insteon devices primarily communicate with each other over the powerlines themselves, so they are very easy to set up. And the beauty of PowerHome and Insteon… they can talk to each other. PowerHome does this by the use of a USB Insteon module that plugs into a wall outlet. So, if I do turn on my bathroom light, PowerHome can also know about it and also open my garage door, or tun my stereo off. Again, I don’t know why, but I could. And PowerHome can also tell lights to turn on and off as well, such as at sunset/sunrise or upon a door opening. Since my security system, lighting, and PowerHome are all so tightly integrated, I can also use a web browser from anywhere in the world, or my cell phone, and turn lights on and off, arm and disarm the system, and open and close the garage door. Not only is this convenient, but it also increases the home security and safety of the house. I don’t forget to arm my alarm, close the garage door, or turn the porch light on at sunset. Lights come on as I enter dark rooms. And I can monitor the whole system very easily. Inevitably after I get comfortable in my couch to watch a good movie, I realize that I haven’t set my room lighting to the optimal levels. Or I realize that I have left lights on upstairs. Because I am lazy, I don’t want to get off the couch to dim the family room lights or even worse, go upstairs to turn those lights off. Instead, I just press a button on my Harmony remote control and the lights are set however I want. You will also need an USB-UIRT to receive the IR signals and a 24/7 computer running PowerHome to do the work (I use my HTPC). Of course, you will also need some type of automated lighting. I have Insteon to control my lights. 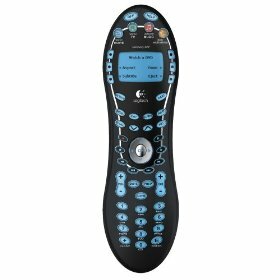 You could do this with an old, unused remote, but I don’t like to have any extra remotes lying around my family room, so I really prefer the Harmony remote for this. If you don’t have a Harmony remote, and you don’t want to bring another remote into your living room, one other option would be to assign an unused button on your current remote control to be your lighting button. The whole idea here is you need transmit a unique IR signal such that whenever it is seen, it will, say, turn your upstairs lights off. If you do have a Harmony, you can add a new device that you don’t currently have in your home theater (you don’t want to be sending out signals that actually do something). Then you can go to the adjust buttons menus and Rename the labels for the soft buttons. Label one “Upstairs” and one “Fam Room”. It doesn’t matter what the IR command is. It could be channel up, the number 8, video toggle, mute, or anything else. We will learn the commands into the USB-UIRT and PowerHome, so it doesn’t matter what command is coming out of the remote. Next, install the USB-UIRT and make sure it is working. To do that, just… um.. plug it in. They are pretty much fool-proof. Next, we need tell PowerHome that you have a new controller. Go to the PowerHome explorer and expand the Setup branch and add a new Controller. You will see that there is already support for the USB-UIRT. Go into the settings for the device and set the type to “Pronto”. Shut down PowerHome and restart. PowerHome is now ready to receive IR triggers. Next go into the PowerHome explorer and expand the Setup branch once again. This time go to Devices. Add an IR device and set it for about 20 IR commands. Then you can expand the newly added device in the navigation tree and start learning IR commands. Right click on a blank row and choose “Learn IR”. Take your remote control to the USB-UIRT and press the button corresponding to the command you are learning. I have found that you have to get an inch or two away from the UIRT when learning commands. If it learns OK, you should see an ASCII string representing the command. Now we need to add a trigger for the newly learned IR command. But before we can do that, we need a macro that will be executed whenever the IR command is detected. Build a macro that has the one line INTSTEON GROUP OFF and select the group corresponding to your upstairs lights. Run the macro and ensure your upstairs lights turn off. Now build that trigger. Select the trigger type to be IR, select the device and command. Enter in the macro to be run and you should be good to go. Press the button on your remote and the lights should turn off.